Breakfast began today with protein plus. A day that begins with protein makes me feel less hungry. Do you eat eggs and vegetables for breakfast, or do you opt for oatmeal and fruit? Which is best? Opinions vary about whether or not carbohydrates should be included in breakfast. Friends joke about the eggs that I eat. You can browse this blog and see that I love to eat eggs. But they’re nutritious. It seems that I’m not the only one with this opinion. Ines Subashka, a certified personal trainer at inspiredfitstrong.com favors eating eggs early in the day – seven to eight eggs. Ines Subashka recommends eating carbohydrates at night before you go to bed. This reminds me of the night comfort food for children – two cookies and milk before bedtime. Saving carbs for the evening snack sounds good. It’s like you are eating nutritious meals all day and saving dessert for last – not that it has to be a serving of cake or pie every night. Try out this omelet topped with chili. You can use canned or your own Slow Cooker Hobo Chili recipe. I used my slow cooker chili recipe. Chop onion and red bell pepper. Saute vegetables and herb in coconut oil on a griddle. When vegetables and herb are soft, add eggs. Stir mixture and form into a rectangle. Fold over half of omelet then the other half. Heat chili in microwave or on the stove, and put it on top of the omelets. If you followed my blog posts last month, you know about my 30 days of slow cooker meals (like the Hobo Chili). This month I will focus on nutritious food. April’s slow cooker meals were challenging, but staying nutritious-minded throughout the month of May might not be the easiest thing to do. The reason is because I like sweets and bread. So join me on this nutritious journey and find out how I’m keeping up with the challenge. I have an aunt and a friend who are both tiny and eat like a bird. No, that’s not true. A bird eats more than they do – at least birds like Muggsy the Macaw that I blogged about awhile back. Muggsy’s owner, Larry, is a professional driver and takes the beautiful and smart bird with him on his trucking journeys. I was quite fascinated with Muggsy’s diet. He even eats a four-egg omelet every day, fresh vegetables, and carbs – a cookie. What are your own experiences with nutrition? 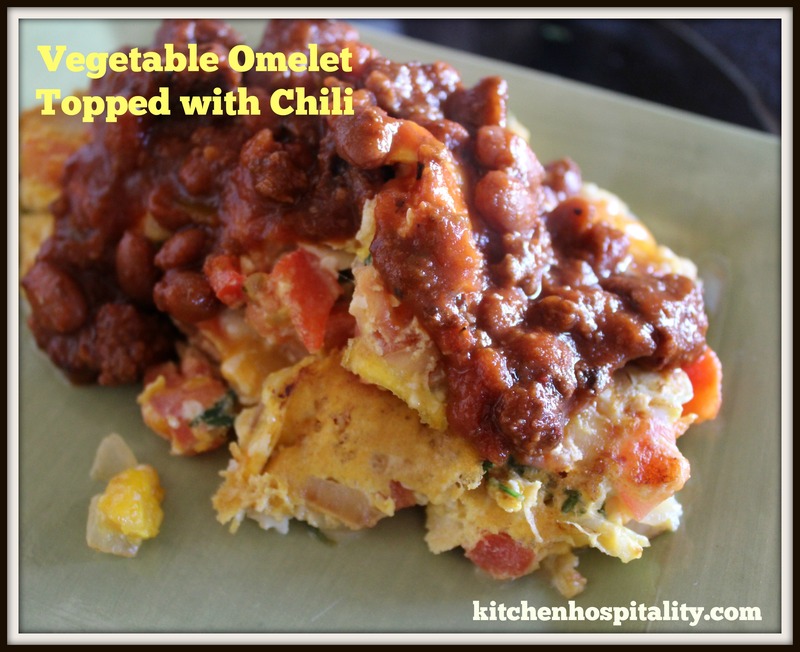 Chili omelets are a favorite around here. May I include your recipe, photo, and post in a round up that I’m doing for ways to use up leftovers Chili? It will, of course, contain a link back.